A person with an intellectual disability cannot get a job: true or false? 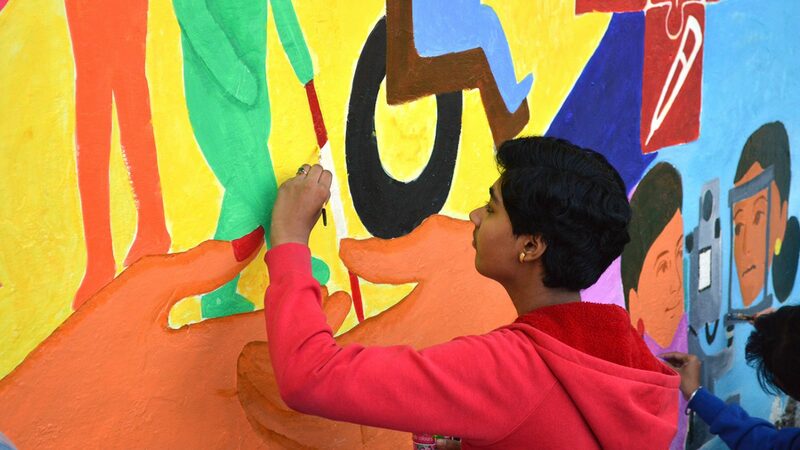 That’s one of the questions I put to the art students in Bhopal who’d volunteered for our Inclusive Art Project to mark this year’s International Day of Persons with Disabilities on 3 December. After a short, lively debate among the young artists they decided the answer was ‘false’ – people with disabilities can and do work. Though – they concluded – not enough do because of the preconceptions many employers have. 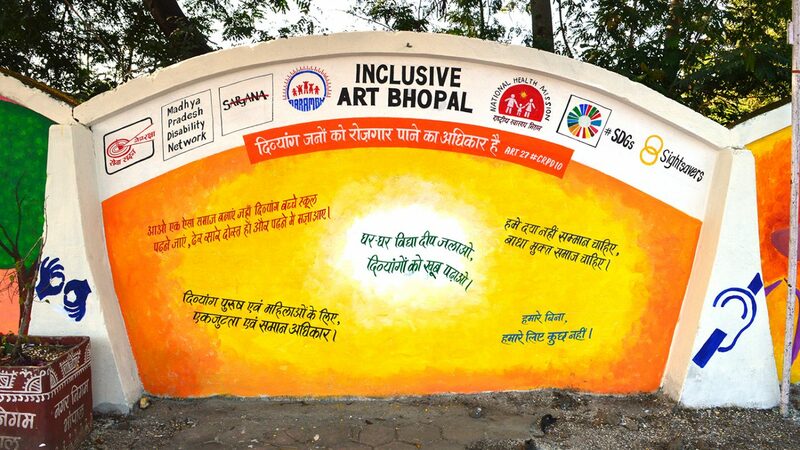 The plan, devised by Sightsavers’ North India office which is based in the capital of Madhya Pradesh, was to paint murals on the walls around a major hospital at a busy traffic intersection in the city, and add messages from local people with disabilities, to raise awareness of their rights and the need for them to have equitable access to education, healthcare and jobs – all basic human rights clearly expressed in the United Nations Convention on the Rights of Persons with Disabilities, which celebrates its tenth anniversary this year. Bhopal is a particularly poignant place to celebrate the International Day of Persons with Disabilities because 3 December is also the anniversary of the 1984 gas disaster – known here as the gas tragedy – when half a million people were exposed to a leak of poisonous methyl isocyanate and other chemicals from the Union Carbide pesticide factory. At least 3,700 people were killed and many more left with permanent disabilities. While official studies linking the Bhopal disaster to health consequences for children and grandchildren of those exposed to the gas are lacking, a higher prevalence of disability in these generations has been observed. On the eve of the anniversary, along with colleagues from the North India Office, I visited the Chingari Trust, an organisation set up by two survivors, Rashida Bee and Champadevi Shukla, to help the rehabilitation of children affected by the leak. By coincidence, the Trust is supported by The Bhopal Medical Appeal which is based in Brighton, only a few miles from Sightsavers’ head office in the UK. Thirty-two years ago, after the disaster struck, Sightsavers immediately ramped up its activities in Bhopal given the number of people left with serious eye conditions and other disabilities. 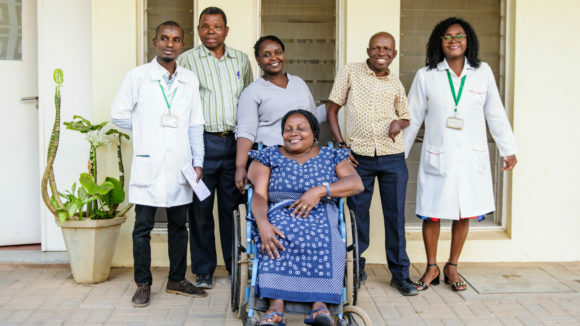 Last year, the organisation chose the city to pilot a project to develop ways to ensure people with disabilities, women and other marginalised groups get equitable access to eye health services. 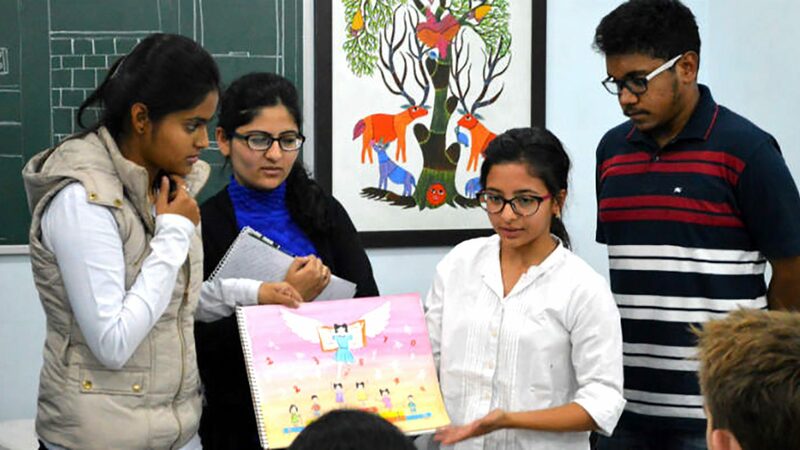 Back in the present day, after two days’ work, the students from the Sarjana Academy for Design and Fine Art had their first drafts ready and presented them to Sightsavers staff and the Academy’s Director, Sunil Shukla. Following another day’s work revising their designs, the students gathered bright and early on the morning of 3 December – which was unusually cold and foggy for this time of year in Bhopal – and quickly got to work. Curious passers-by and local media were drawn to the spot to find out what was going on. At the same time, in another part of the city, the Inclusive Eye Health project was mounting a different initiative in the informal settlements – known locally as ‘slums’ – of the Anand Nagar area. 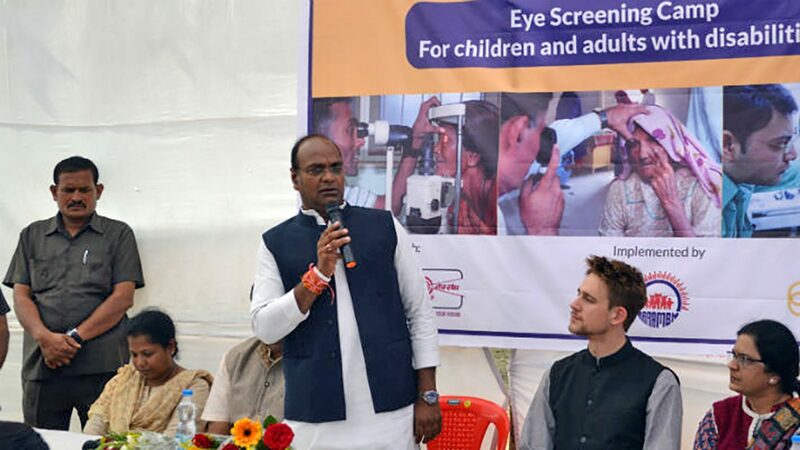 Sightsavers and its partners, the development agency AARAMBH and Sewa Sadan Eye Hospital, collaborated with World Vision India to organise an eye screening camp for children and adults with disabilities. Scores of people with their children came from the local area, and by specially provided transport, to have their eyes tested and – if they required it – be referred to the hospital for treatment or spectacles, both of which are provided free to people on low incomes. As young boys from the district played cricket on the dusty ground next to where the clinic had been set up and cows wove in and out of the traffic on the nearby road, Madhya Pradesh’s Minister for The Bhopal Gas Tragedy Relief and Rehabilitation, Shri Vishwas Sarang, came to welcome the people who’d come to the camp and to thank Sightsavers and its partners for the initiative. In the space of a few hours, 66 people had their sight tested. 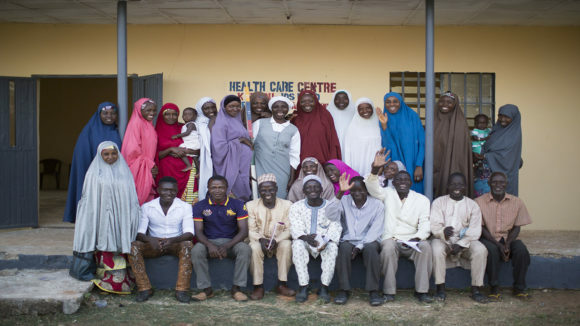 Eight were referred to Sightsavers’ primary vision centres for refraction. Five were referred to Sewa Sadan Eye Hospital for cataract surgery and three for corneal opacity and squint. Seven were prescribed spectacles. 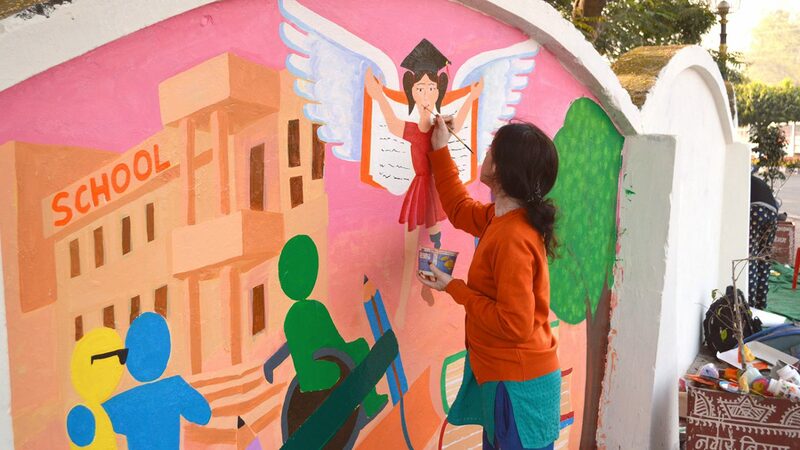 Meanwhile, the students of the Sarjana Academy had made good progress on their murals and had finished their striking paintings which were already attracting curiosity from passing cars, buses and motorbikes, which slowed down for their passengers to take a look. 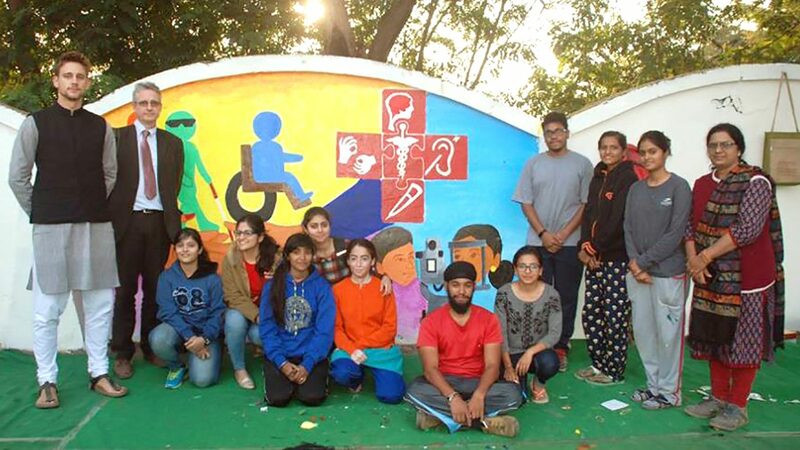 The students met their deadline of sundown, and the young artists were back the next morning to paint the other three walls that JP Hospital had made available with the messages that had been collated by the Madhya Pradesh Disability Network, an umbrella organisation led by people with disabilities to get their rights recognised by the government. 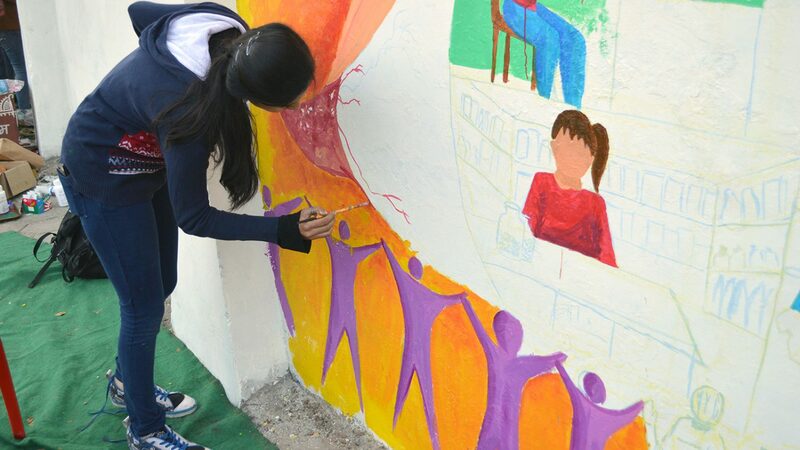 The works were soon finished and the following afternoon, students, government representatives, members of the Disability Network, staff and volunteers from Sightsavers and our partner organisations converged at the murals for their official inauguration. Senior officials from the National Health Mission unveiled the paintings, renewing their support to Sightsavers and its partners for the Inclusive Eye Health initiative and the efforts to raise awareness on disability issues in Madhya Pradesh. In their speeches, two representatives of the Disability Network congratulated the young artists, expressed their appreciation for being involved in the project, and underlined how collaboration between government and civil society is crucial to mainstream disability inclusion in the State. Finally, the students shared how meeting people with disabilities and taking part in this initiative changed their perspectives on disability and inclusion. Through their artworks they demonstrated tremendous creativity and a strong willingness to participate in society as active citizens and changemakers. 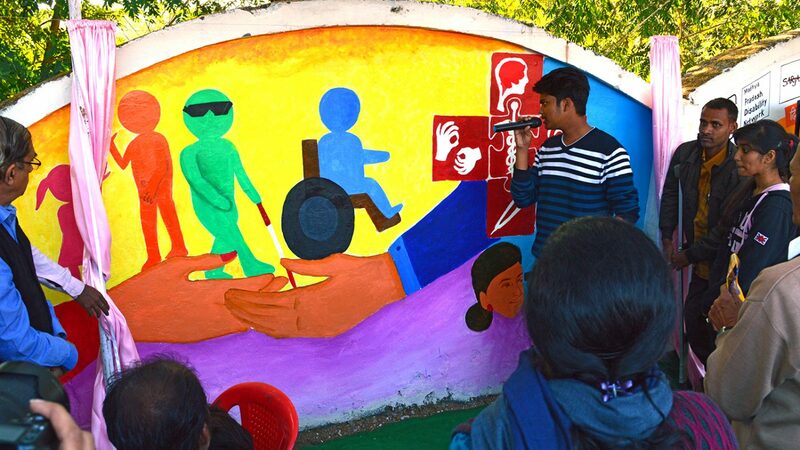 The mural art and the outreach camps in Bhopal are part of Sightsavers’ efforts to perfect a model for Inclusive Eye Health services which can be replicated and scaled up in other areas and countries where we work – and which, in the years ahead, could be incorporated by health authorities and providers in their work. 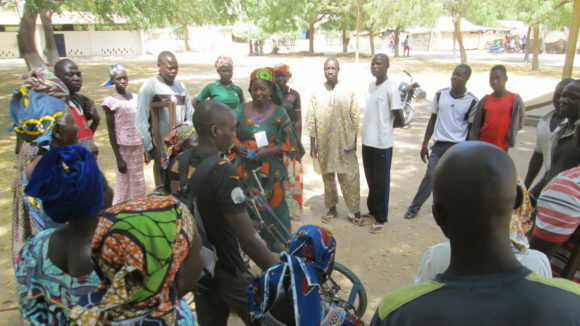 Sightsavers is also working to help implement the Sustainable Development Goals. One of the goals’ central themes is that no one should be left behind in our quest for a prosperous future that doesn’t ruin our planet. This applies to people with disabilities as much as anyone else.